I had a really, really bad MISS when styling this purple jacket a few days ago - I'm debating whether to even post it as part of my 30 x 30 or to pretend it never happened. I put the purple blazer away for a few days hoping to let my mind rest, and the resting worked out because this outfit came to me while I was sleeping last night and I couldn't wait to wear it to work today. I'm really loving this new-ish necklace my friend gave me for my birthday. We were shopping together one day before Christmas and Banana Republic was having a 40% off everything sale. I expressed interest in the necklace and she grabbed it from me and bought it as a gift! What a nice friend, right? No close up pics of the necklace today but it has purple stones, so it goes great with all my new purple clothes :) What's your favorite thing you've bought/received recently? So in love with the color of your blazer! Thanks so much for linking up with me today! Great pattern mixing here- I really love that skirt! 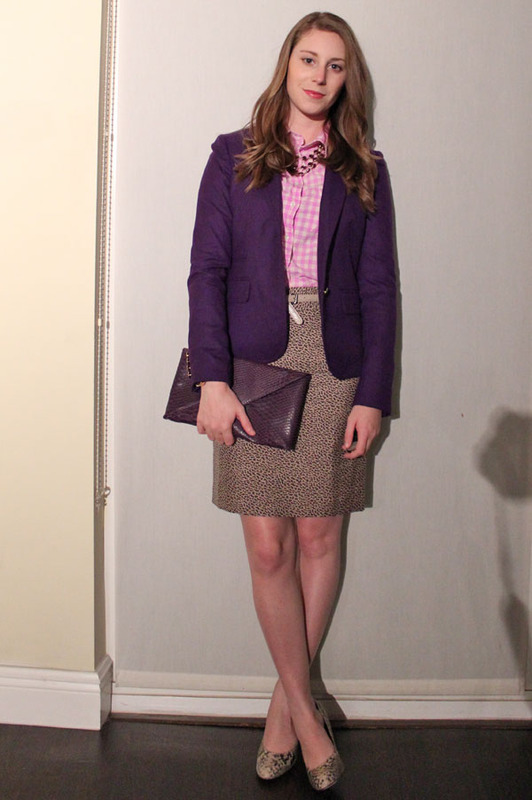 Love the blazer fit and color--heading over to J.Crew now...this could be dangerous! You'll get some great deals if you shop the 40% off sale!